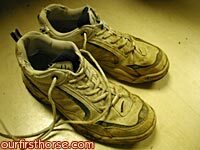 When I thought about writing this post, I was planning on discussing the fact that every horse owner who does their own horse management duties is quickly going to learn they need an old pair of shoes for working in the barn. That, of course, is true, though I might add that if you don’t already have a pair of barn shoes, worry not as the barn will claim the first pair you wear. This past Saturday, Mikki, the Kid and I spent time catching up on chores since it was warm and sunny outside. By the end of the evening, we were sore and our clothes were pretty dirty. If you haven’t already done so, plan on setting aside a pair of old shoes, some old T-shirts and yucky jeans. Heck, we’re thinking about buying some overalls, too, since, you know, we live out in the country and all. Dogs will run through the mud and then jump up on you, your horse will take a drink and then slobber buckets of dirty water on your clean shirt, a glob of fresh horsey poo will surely drop off the manure scoop onto your hat (get a hat!) as you’re cleaning a stall and even more glamorous things you’ve never thought of will happen, so trust me on this one. Your barn shoes will be subjected to corrosive ammonia and stinky mud, some of which may never come off. You should also consider investing in a decent pair of mucking boots. On those rainy days your feet will stay drier and you’ll thank me when that large pile you haven’t cleaned up yet doesn’t ooze onto your socks. Some people opt for steel-toed shoes or boots but I’m not planning on cleaning Valentine’s stall when he’s in there so I’m going to skip those.